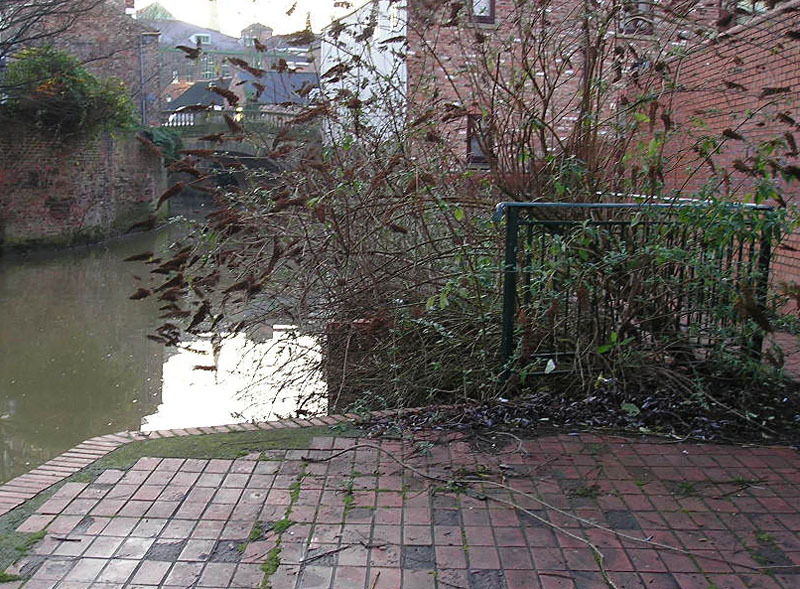 From the paved bank of the Foss between Foss Bridge and Rowntree Wharf, in 2004. 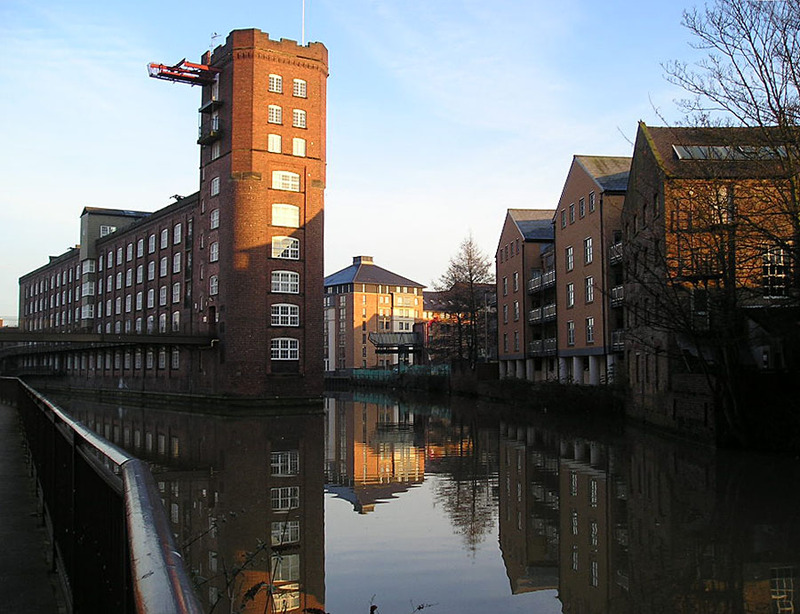 I’m not sure why I didn’t take the more conventional view showing the full height of that impressive 19th century building, but this photo does capture some of the buildings on the opposite bank, to the right, and this is where the obvious changes have happened in the intervening years. The river here now reflects new buildings, taller. 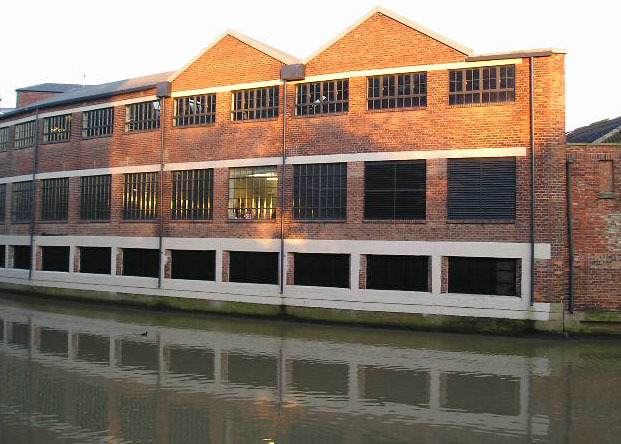 Residential accommodation built on the old yards off Walmgate. The old industries based here are long gone. The river is something we look at rather than something we use for the transportation of goods. 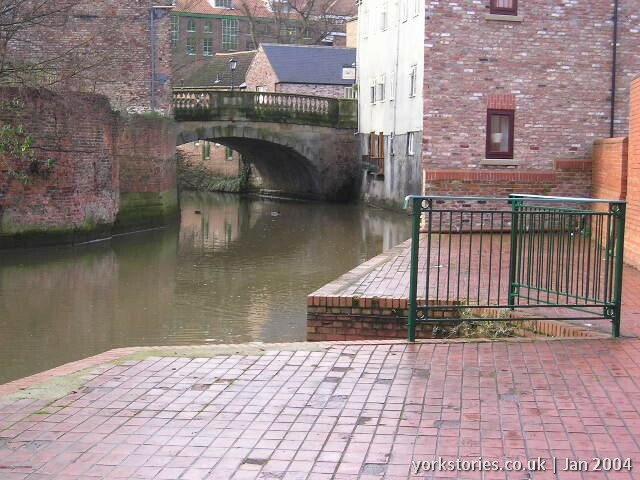 Looking the other way, towards the picturesque Foss Bridge, in 2004. A friend first showed me this place about thirty years ago. We used to sit here and talk and smoke cigarettes. It’s apparently still a favoured spot for young people to gather – a group arrived while I was there. I was conscious of them sitting behind me on the bench, no doubt thinking I was a bit mad, as I made several attempts to line up properly this next 2014 ‘view’. Yes, that is the same view, more or less. The bridge is in the background, obscured by the winter remains of a thriving shrubbery. Buddleia bushes growing out of the river bank. Buddleia does grow very quickly, and makes a lot of growth in a season, but this could be several years’ worth of growth. It has certainly got its roots down and got well-established in these Foss-side niches. 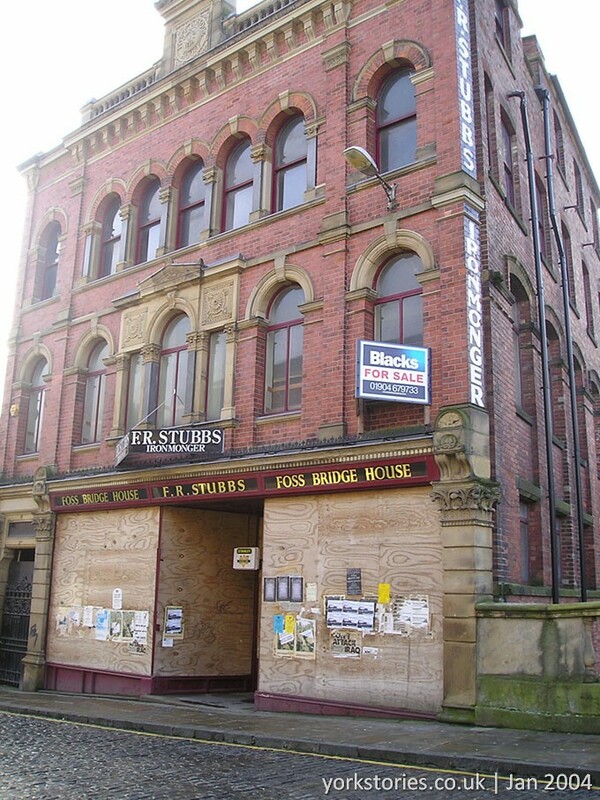 The impressive Foss Bridge House, boarded up and empty in early 2004, but still proudly signed – the home of Stubbs the ironmonger, as it had been for almost a century. At the time I took the photo the shop must have been empty for a year at least, as the posters pasted on its boarded windows say ‘Don’t attack Iraq’. It didn’t stay empty for long. The refurbishment of this listed building included the repainting of some of its old Stubbs signage, but with the more prominent ads on the corner brickwork near the entrance replaced with the Loch Fyne name. Also next to the Foss, a stone’s throw away. This isn’t a landmark building, it’s just one of those fairly ordinary 20th century buildings fronting on to Piccadilly. I can’t quite remember what it was used for back in 2004, but I’ve always quite liked the way its side curves with the river. This photo was taken, I guess, because of the large banner. Hard to read on this old low-resolution photo, but it’s an ad for the ‘Castle Quarter’. A ‘radical new vision’, so radical it was never realised. Instead of a massive project involving the complete redevelopment of a large area, we’ve settled for smaller-scale piecemeal redevelopment of some of these Foss-side plots. Work looks set to begin soon on some of them. But this building remains, and is unlikely to be demolished in the ‘regeneration’ of Piccadilly. 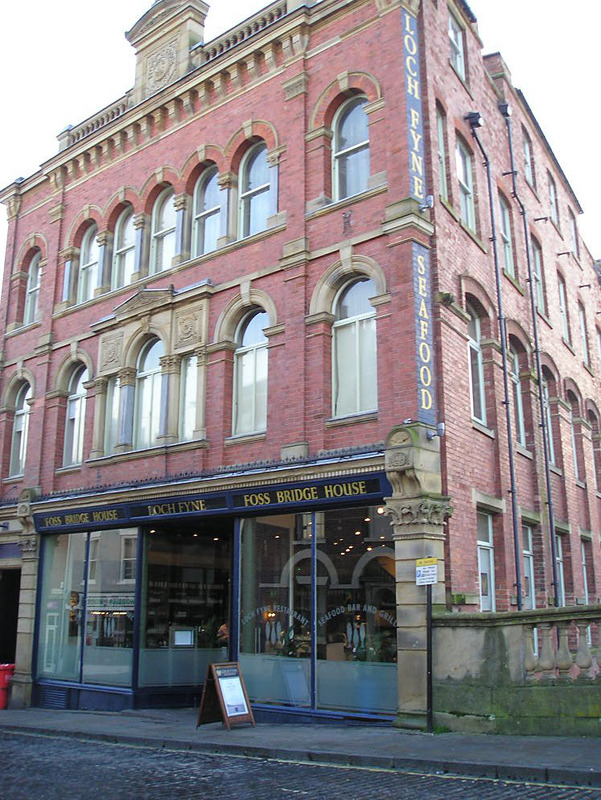 Part of it, fronting onto Piccadilly, has been for some years now occupied by a Tesco Express. 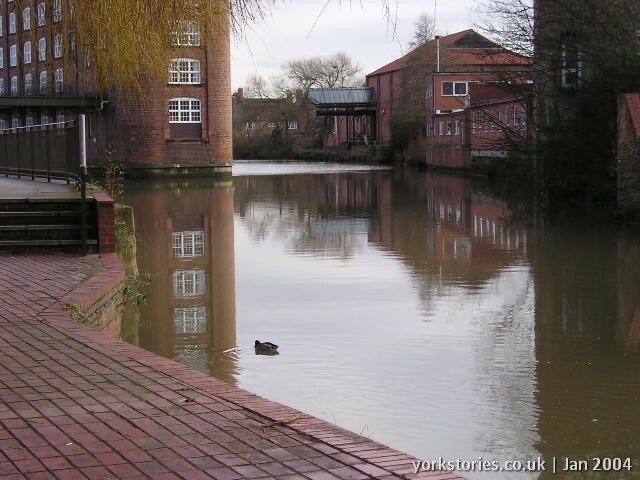 Its river-facing side has been considerably smartened, the brightness doubled in its reflection in the Foss. Old Foss, flowing slowly on its way to the Ouse, past so many changes, over the decades and the centuries. My walk took in many more places, from the bar walls at Bootham to the highlights of Hungate, before my old camera’s card got full. More later perhaps. 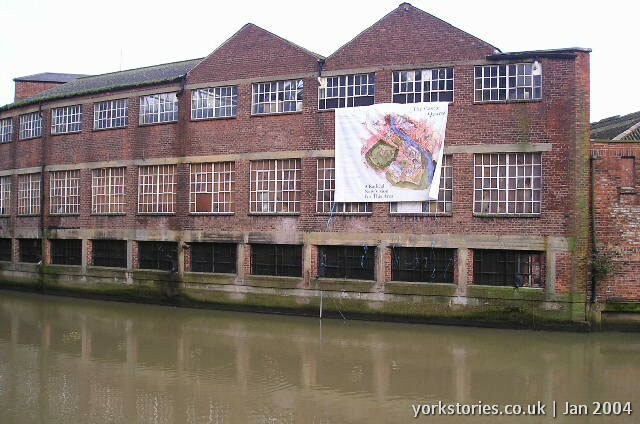 Great Pics of the business end City wise,of my Fav.river.Best remembered by following it along to Foss island Rd,Foss bank,under Monk Bridge,past Dennison St,along Huntington Rd,past the old workhouse building,under Iron Bridge Railway(now cycle path),up to the bridge at Foss Way.Thats the place,where we played as kids with cane rod and bent pin or fishing net to catch the tiddlers that abounded near the large drainpipe that out flowed from the Fever Hospital,into the river.Looking back I wonder we did’nt catch any thing nasty,but maybe we were tough enough to resist infections then. by all the youngsters in the Fossway,Dodsworth Avenue and Pottery Lane area’s,some very strong rivalries were resolved that way!